Supreme Court for Kenya go do one last-minute hearing whether or not di re-run of di country presidential election go happen for Thursday. Di court go hear one sharp-sharp petition on Wednesday 25 October, to decide whether to move di election go front - dis na one day before e suppose happen. Di electoral law no too dey clear between di constitution and how di courts don use talk am. Supreme Court don agree to hear di last-minute petition, wey dey ask question whether di electoral commission and e chairman go dey able to conduct free and fair election dis Thursday. Na one of dis law wey no clear make main opposition leader Raila Odinga to describe di re-run election as "wayo election…joke…and play-play." 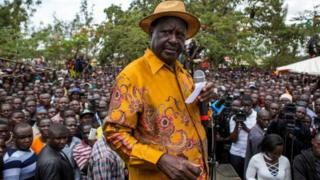 Odinga talk with BBC, say make im supporters dem no come out to vote dat election day and make dem stay for house. "Dem dey do di same thing, di same way, and dey never make di changes wey dey demand for better election." Odinga talk say na only Kenya people go fit solve di problems wey dem dey pass through as im dey reply to di warning wey dey come from Western diplomats wey say Kenyan politicians need to stop dangerous behaviour. Di Supreme Court cancel di first presidential election because of wetin dem talk say na "irregularities and illegalities". Different protests na im don dey happen for Nairobi and western Kenyan area of Kisumu wey be di stronghold of di opposition, but Odinga claim e no dey try to put di country for danger. E say di "fake election" no make sense and na waste of public funds. But im supporters don enter di street of western city of Kisumu to protest against Thursday presidential re-run election. Image example Protesters say dem wan changes before di election on Thursday. Di protesters wan make dem move di election go front until dem do di changes wey dem want for di electoral system.